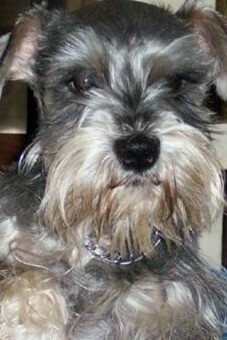 Good bye to Baxter, age 14 Salt and Pepper Mini-Schnauzer, aka; Foreman of the Ranch. He was given to me by my almost son: Dean Radcliffe. He flew him down to me from Alaska 14 years ago. I fell so completely in love with , my husband Ron said to me: “You need to get another dog. If something ever happened to Baxter, I don’t think you would recover.” I took his advise and ended up with dozens of dogs through the years, becoming a dog breeder of Quality Dogs.There was never any doubt the number one dog on the Ranch and in our hearts was Baxter. He was the perfect dog. He never walked on a leesh. It was beneath his dignity. He was voice controlled. He instinctively knew the boundaries of the Ranch . He did his patrol every morning. Never chasing the cats, horses or the chickens. We had him nurtured when we were unable to get his AKC papers. It did not matter to him. He mounted and locked with all the females and thought all the puppies were his. No one could tell him any different. I had Baxter in my car one hot summer day. We were crossing the Antioch Bridge. I saw a broken down old Hippy looking van on the side of the road about half way up the bridge. Then I saw a man walking and looking very hot. I realized he probably would have a heat stroke before he got to the other side of the bridge in this 110 degree heat. With feelings of compassion, I stopped the car and offered the man a ride. Had I have known this guy looked like a convict with his tattoos, missing teeth, long dirty hair and meth wild eyes, I would not have stopped for him. Baxter did not like his looks either. He barred his teeth and growled the whole time the guy was in the car. I had to hold Baxter back by holding onto his collar. “He won’t bite me, will he?” The nervous man asked. The blood drained from the man’s face and he clung tighter to the door. Baxter continued to snarl. The car did not come to a complete stop before the man jumped from the car. Baxter and I high fived each other and knew we would always have each others back. Now, Baxter was my dog. There was never any doubt about that with Baxter and me. Except we didn’t tell Ron. Ron always felt that Baxter was his dog. “That’s my boy”. He would praise. Baxter was such a diplomat he made us both feel he was our dog exclusively. When he was a puppy we bought him a doggy bed that sat on the floor at the foot of our bed. When the other dogs started sleeping on the bed, I would offer to lift Baxter up but he felt it beneath his dignity and preferred his bed. Once in a while he would test me. He would place his paw on the side of the bed and wolf. As though asking for permission to join the bed pack. So, I would lift him up. He would walk from one end to the other and then jump down to the floor. Just checking. Making sure he had the option. My wonderful Ron is an ex-Marine and had promised our beloved Mini-Schnauzer; “Baxter” that he would put him down when the time came when he had pain and no quality life. Baxter labored with pain yesterday, panting and not leaving his chair. I gave him pain meds but to no avail. So, Ron dug a hole for his grave in our Rose Garden, where he will join our beloved Rosie and Senorita Juanita and our old cat Handsome. He then took him out and said his good-byes. He came back into the house with his gun and tears in his eyes. Saying quietly; “The deed is done”. We hugged each other, cried and then sat and told “Baxter” stories for awhile. Easing our grief. We will so miss our wonderful Baxter. He left such a Legacy. It is because of him that we went into Breeding Dogs. We so loved him and wanted to share our joy of dog ownership with others. He was 14 and had a wonderful life. We referred to him as the Ranch Foreman. He truly ran the place. Thank you Dean for the best gift I have ever received. This entry was posted in Birthdays..Aging..Fear of Aging..Glories of getting older...wisdom...advice..., coping, Death, Death..grief..sorrow...coping...mending, Doggy Tips, mending, sorrow, Uncategorized and tagged mini-schnauzers, moments in life, remembering the time, uncanny sense. Bookmark the permalink. laughter and tears all in a great one minute read! What a wonderful gift you are to me Mary and Hiedi Claire Baxters mom was to us all! Magnificent items from you, man. I have take into accout your stuff previous to and you’re just extremely excellent. I really like what you’ve obtained here, really like what you are stating and the way in which in which you say it. You are making it entertaining and you still take care of to keep it wise. I can not wait to learn far more from you. This is actually a terrific website. Mary, although we have never met I feel like you are truly a good friend to people. I just lost my husband on may 24 th and my heart is breaking right now. I can relate some of my feelings to the things you write about regarding your dogs and your sons. We live so close to eachother and maybe someday we can actually meet. Keep on writing, you touch many lives with your words. While Congress may remain gridlocked, Mousin noted President Obama was able to take action through a discretionary enforcement policy, enacting parts of the failed 2010 DREAM Act through executive order.